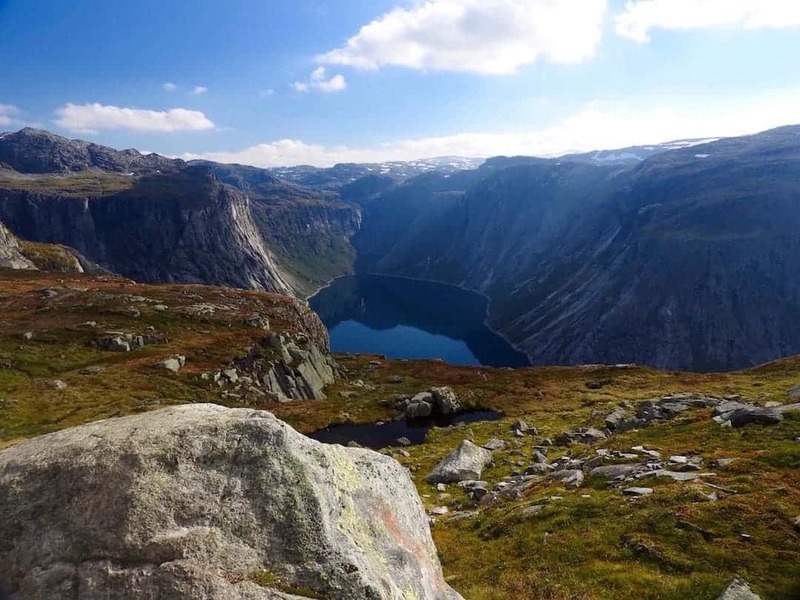 The top 3 spots not to miss in this beginner’s guide to hiking in Norway. Experience epic views like this when hiking in Norway! I am not a hiker. I like to think of myself as an active adventurer, but when it comes down to actually hauling myself up anything close to an incline, I quickly lose enthusiasm and start craving the comfort of my couch. My short legs and low blood pressure do not mix well with high altitudes and full blown exertion. However, despite this I have been drawn to the many glorious hikes on offer in the mystical land of Norway since I began my travels several years ago. After all, you can’t go all the way to Norway and not see at least some of the many gems in its crown; in its breathtakingly beautiful fjords. I decided to put my will power to the test, grab the closest thing I had to hiking shoes, and book a ticket to the Scandinavian stunner. I tackled three of its most well-known hikes, and have left you with a rookie’s guide to hiking in Norway and seeing the best of this magnificent country. If you’re travelling elsewhere in Europe, don’t miss out on the epic hiking in Switzerland! Pulpit Rock, or Preikestolen as the locals call it, is one of Norway’s standout postcard performers. Measuring approximately 25 metres by 25 metres, the jagged rock protrudes around 600 metres above the water, making it the perfect location to admire the view of the incredible Lysefjord below. The platform is located in Norway’s south-west, about a two hour drive from the country’s third largest city, Stavanger. Taking a car to the rock is an easy option from the city, with many hire-car options available. It also makes for a great way admire the incredible countryside at your own pace, while experiencing one of Norway’s most common modes of transport – the ferry ride. Buses are also available, depending on the time of year. 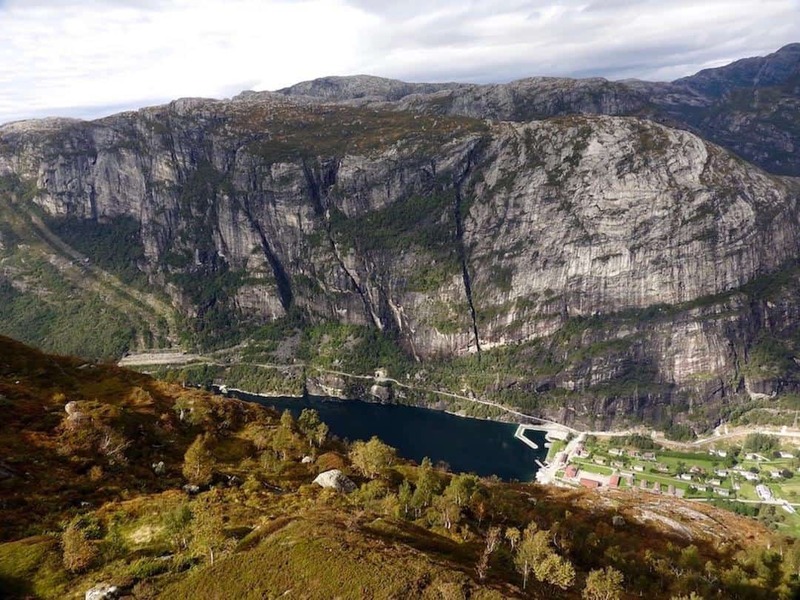 Once you arrive, the track towards Preikestolen is clearly signed and easy to walk; with stone stairs and wooden planks laid out as you meander through the native vegetation. Hiking boots are a great help, but the walk is easily manageable with regular sports shoes. The good news is Pulpit Rock is suitable for almost anyone with reasonable fitness. The hike is a distance of around 4 kilometres, and takes between 2 and 4 hours. Plus, the steepest section of the climb is early in the trek, so you can relax for the remainder of the journey, knowing the hardest part is over! There are plenty of ideal picnic spots and photo opportunities along the way, so be sure to take your time and pack water, snacks and your camera! Norway hiking spots are pretty popular! As you walk towards the top of the cliff, you’ll be rewarded with an ever-improving view, and feel like you’ve been dumped right into a scene from “The Land Before Time”. It’s hard to believe your eyes as you gaze upon what seems like a never-ending mass of water, caressed by the dramatic barren faces of the cliffs above. And to make it all the more enchanting, just the right amount of mist hovers in the air, leaving a dreamy view you can’t quite believe. For an optimal crowd-free experience, aim to tick Preikestolen off your bucket list early in the morning during shoulder season, in April/May or September/October. This way you won’t be crawling up in single file, and are more likely to ensure stranger-free photos! The snow should also be clear, and the track open to walk. For anyone wanting to set their eyes upon the fjords of Norway, this is a fantastic option. The return on your hiking investment is more than worthwhile, and manageable for those with minimal fitness levels. If you’ve got limited time for hiking in Norway and want to tackle an easy, rewarding walk – this is the one for you! Check out the best hiking in Romania for some more off-the-beaten-path treks! For those in the Stavanger area looking for more of a challenge, Kjerag is the place for you. With steeper inclines, slippery rocks and a scarier photo set, Kjerag is not for the faint-hearted! From Stavanger, Kjerag Mount is about a three hour drive. For a different view of the Lysefjord, traveling via ferry at least one way is a must. You’ll be able to see both Pulpit Rock and Kjerag from the water, and get a real grasp of the scale of the beautiful fjord from below. Before you arrive at Kjerag, be sure to pack your hiking boots, several layers of clothes, water and snacks. The hike is challenging and only recommended for those who are reasonably fit. If you’ve got joint problems, health struggles or are unfit, the climb (and it is a climb) may be too much. Set aside 4 to 6 hours for the trek, and make sure you’re prepared! Like Pulpit Rock, the most difficult part of Kjerag is the initial incline. You’ll feel like you’re climbing at a 90 degree angle with no reprieve, and start questioning your commitment to the journey! However, once the initial hill is complete the worst part is over. Two or three more major inclines remain that will leave you short of breath, but none as steep as the first! Along the way, a clear path has been set out, laid by Nepalese sherpas. We were lucky enough to meet some of them, and were blown away by their strength and expertise! The stone paths, wooden planks and ropes are a Godsend, and make the walk a lot safer. After several hours of hard labour, you’ll reach the peak of the mountain at around 1000 metres. The final section of the climb is relaxingly flat, and a welcome break from the steep track behind you. It’s here where extra layers of clothes come in handy, and you might be needing an extra jacket as the altitude chills the air! After about a half hour walk along the mountains’ plateau, you’ll reach the famous Kjeragbolten – where a round rock sits tightly wedged in-between a crevice in the mountain, making a more than desirable spot for a photo! Kjeragbolten is reasonably safe to climb on at your own risk, but not as flat as one might hope, so make sure you’re careful when mounting the rock. If you have the time, make the most of the view at the top of the mountain and stay as long as you can. We found ourselves rushed to get back down to make the next ferry, and would have loved more time to enjoy the product of our hard work! The track is open from June until September, so if you’re ready for the challenge be sure to plan your hiking trip during the Norwegian summer! Everybody wants this photo here! Reflecting on my journey to Trolltunga leaves me with mixed emotions. This is the hike to conquer all hikes. The hike I liked the most, and feared the most. The 23 kilometre trek left me with blisters, joint pain and serious muscle soreness, but was quite possibly the best hike I’ve ever done! Trolltunga is a rock protruding about 700 metres above lake Ringedalsvatnet in Hordaland country. We traveled to this spectacular hiking location by car from the small city of Bergen, in what was a scenic three hour journey on a glorious Autumn day. 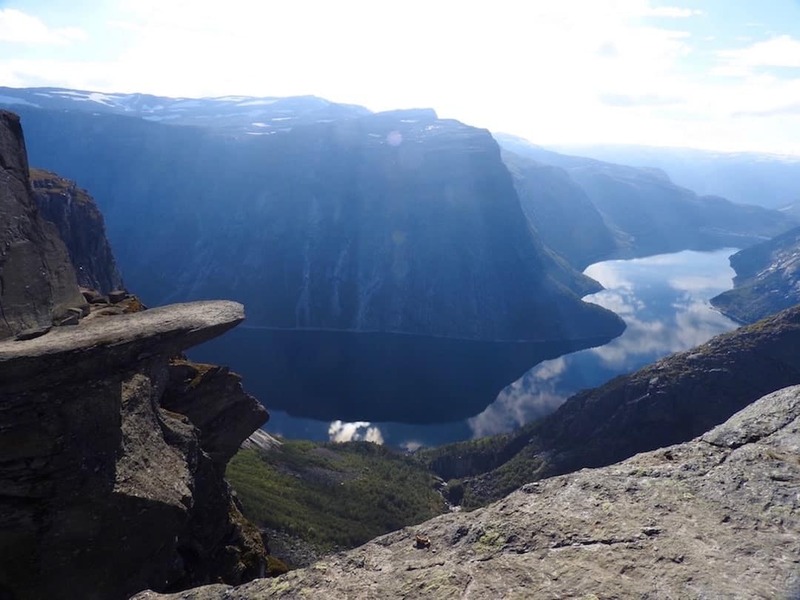 The climb to Trolltunga is certainly the most challenging of all three hikes. Not only is the trek longer and very steep in parts, it can also be home to some seriously dramatic weather changes. Be sure to check the weather forecast before you leave, and only attempt the hike in optimal conditions. In preparation for the challenge, make sure you pack hiking boots, and plenty of high energy snacks. Your water bottle can be filled with the deliciously fresh water that trickles down the mountain, but pack a few small bottles just to be safe. Extra safety equipment is also recommended, such as a torch and first aid kit, as well as waterproof clothes. Set aside 10 to 12 hours for the hike and be sure to start early in the morning, in order to maximise your time enjoying the incredible vista. It is not recommended to start the trek much later than 8am. Several signs are placed along the track, offering advice on when to turn around if it’s too late. Rescue teams are inundated with work during the hiking season so its important to adhere to the advice, and keep safe. The track to Trolltunga is usually open from mid-June to mid-September, depending on snow coverage. The first four kilometres are made up of two long, steep, gruelling inclines, separated by a small plateau. These inclines are the most difficult part of the trek, but are thankfully lined with stone stairs, ropes and wooden planks to ease your pain. Be sure to stop for breaks often to catch your breath, and reenergise! Once the initial third of the trek upwards is over, things become much more enjoyable. After all, it’s hard to complain about the difficulty of the hike when such impressive views lie below. The rest of the journey is much more evenly balanced, with only slight inclines and declines along the plateau at the peak of the mountain. Be sure to have your camera out, and take in the stunning scenery and fresh air! After what seems like an eternity, you’ll finally reach the final sign indicating the last kilometre of the walk to the infamous Trolltunga rock. When you’re finally there, you’ll be rewarded with a great sense of accomplishment, along with the most spectacular scenery imaginable. This site gives Pride Rock a run for its money, with steep cliffs, glassy water and blue skies providing an unbeatable backdrop. The walk down is welcome relief for your muscles, but hard work on your joints so be sure to leave plenty of hours of daylight to complete the hike at a steady pace. Your legs may also turn to jelly, so take it easy! Trolltunga is definitely a worthwhile trip that will leave you with a great sense of satisfaction, and a great appreciation for the beauty of this country. However, if you’re short on time, unfit, unhealthy, or unprepared its not worth placing yourself in danger. Travel safely, responsibly and respectfully, and you’ll go home with fond memories of one of the most beautiful places on earth. Have you ever been hiking in Norway? Leave a comment below and let us know what your favourite spots are! Steph is a Journalist who swapped her microphone for a backpack two years ago, when she quit her job in Australia to explore the world. She has since been working and traveling her way through parts of Europe, Asia and Africa, uncovering the varying histories, cultures, customs and cuisines each place has to offer. You can follow her travels on Instagram. Its an amazing guide for beginner must read beginner. The Preikestolen was probably the best thing I saw during my holiday in Norway. We started the ascent around 5 pm which meant that most of the crowds were descending. Since we went in May, the days were long and so it was still bright when we got to the top. At the top there were only a few people about and we managed to get some fantastic views. Would recommend some proper shoes (i.e trainers/ hiking boots) and don’t underestimate how much water you need and there’s not much shade. If I remember correctly, the parking was around 200 kr.